Relieving physician burnout through meditation, gentle yoga, diaphragmatic breathing and Ayurveda will be a major focus of The American Meditation Institute’s (AMI) eighth annual mind/body medicine 30 credit hour CME conference on October 25-29, 2016 at the Cranwell Resort and Spa in Lenox, Massachusetts. Entitled The Heart and Science of Yoga this comprehensive physician mind/body medicine training is accredited through the Albany Medical College Office of Continuing Medical Education. Meditation enhances homeostatic balance and relieves burnout. Relieving physician burnout through meditation, gentle yoga, diaphragmatic breathing and Ayurveda will be a major focus of The American Meditation Institute’s (AMI) 8th Annual CME Conference on Meditation and Yoga Science. Entitled “The Heart and Science of Yoga,” this comprehensive physician mind/body medicine training is accredited through the Albany Medical College Office of Continuing Education. A special lecture on how to use yogic practices will be presented by long time meditators Beth Netter MD, Tony Santilli MD and Prashant Kaushik MD. In an article published in a recent issue of the Burnout Research journal, Anthony Montgomery, associate professor in the Psychology of Work and Organizations at the University of Macedonia in Greece, argues that the way doctors are trained may set them up for a career of high-stress situations. One possible consequence of the high-stress can be a decrease in the quality of care that physicians provide. Professor Montgomery maintains that that while physicians interact with people every day, their medical training and their worth as healthcare professionals are focused almost entirely on their technical capabilities, leaving them with few tools for understanding and navigating social relationships. “The irony is that doctors are the one group of people we don’t want to be stressed; yet we are increasing the possibility for them to make mistakes,” says Montgomery. In his practice, for example, Montgomery observes that his colleagues admitted to learning communication and teamwork skills only once after beginning their medical practice. This year’s American Meditation Institute “Heart and Science of Yoga” CME conference is dedicated to providing quality, comprehensive and evidence-based education to physicians and other health care providers. The curriculum will provide easy-to-use, practical tools to prevent and reverse the debilitating causes and effects of physician burnout. 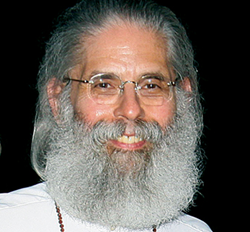 Additional curriculum lectures include mantra meditation, diaphragmatic breathing, easy-gentle yoga, Yoga psychology, meditation and neuroplasticity, PTSD, trauma, resilience, chakra system therapy, mind function optimization, epigenomics, Ayurveda, nutrition, functional medicine, and lymph system detoxification. Each faculty member at this year’s CME conference is committed to the advancement and training of Yoga Science as holistic mind/body medicine. Presenters will include program director Leonard Perlmutter, AMI founder, meditational therapist and award-winning author; Mark Pettus MD, Director of Medical Education and Population Health at Berkshire Health Systems; Anthony Santilli MD, board-certified in Pulmonary and Critical Care Medicine; Prashant Kaushik MD, board-certified Rheumatologist; Sara Lazar PhD, instructor in the Department of Psychiatry at Harvard Medical School, and an Associate Researcher in the Psychiatry Department at Massachusetts General Hospital; Susan Lord MD, a private practice holistic physician focusing on prevention and treatment, and former course director for the The Center for Mind-Body Medicine’s “Food As Medicine” program in Washington, DC; Jesse Ritvo MD, Assistant Medical Director, Inpatient Psychiatry, University of Vermont Health Center; Beth Netter MD MT, holistic physician and acupuncturist, Albany, NY; Jyothi Bhatt BAMS, Ayurvedic practitioner and faculty member of Kripalu School of Ayurveda and Physician’s Assistant at New York Presbyterian/Weill Cornell Medical Center; and Jenness Cortez Perlmutter, faculty member of The American Meditation Institute. Since 1995, program director Leonard Perlmutter has lectured extensively on the health benefits of meditation and yoga as mind/body medicine, including talks at the M.D. Anderson Cancer Center, Albany Medical Center, Stratton VA Medical Center, Berkshire Medical Center, University of Colorado Medical School, University of Wisconsin School of Nursing, Washington University Medical School, the United States Military Academy at West Point, and the Commonwealth Club of California. He also served on a distinguished New York Times panel of Yoga experts with Dr. Dean Ornish. Noted physicians Mehmet Oz (Dr. Oz), Dean Ornish, Bernie Siegel and Larry Dossey have endorsed Mr. Perlmutter’s treatise on Yoga Science, which serves as the primary curriculum for the conference.